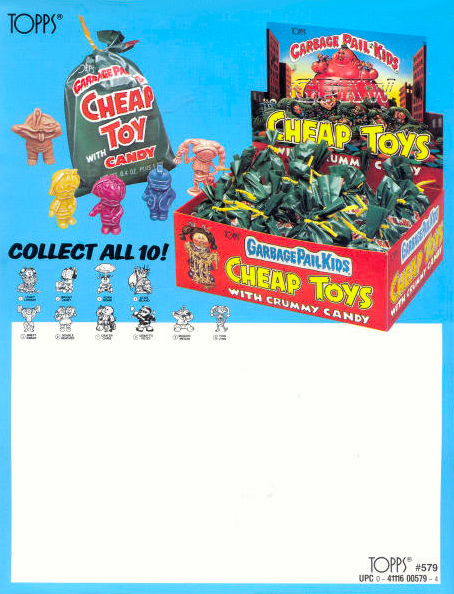 Cheap Toys were released in 1986 during the 3rd series Garbage Pail Kids card set depicting 10 various characters from the 1st, 2nd and 3rd series Garbage Pail Kids card sets in monochromatic colors. 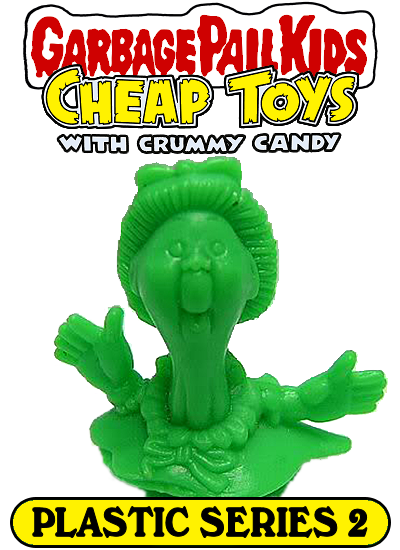 They were packaged in a green plastic 'garbage' bag with a twisty tie and containted one toy, a checklist and different colored candy discs (that tasted horrible). The ten figurines in the set can be found in either green, blue, red, (flesh) pink, orange or yellow colors. Though variations of these colors do exist; such as neon-like colors. A set was also released in the United Kingdom with the same characters but with a different box design. 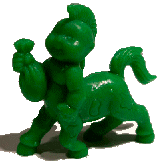 Two sets were released in Canada and manufactured by Nova BonBon, the first set having the same characters as the U.S. and UK sets and the second series containing ten different figurines that came in either green, blue, red, or yellow monochromatic colors. 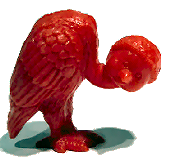 The international candy had a better taste that similar to the U.S. Topps Garbage Candy with shapes such as fish, bones, etc. 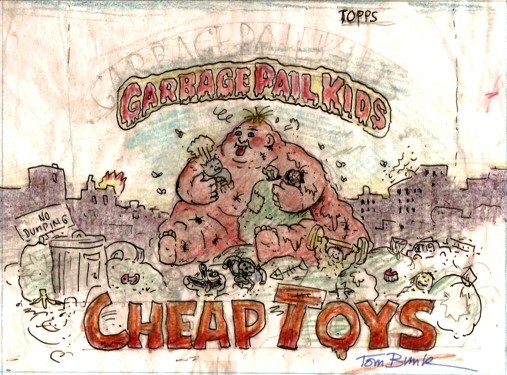 The second series set depicted various characters from the 3rd and 4th series Garbage Pail Kids card sets as listed within the checklist below. 1. 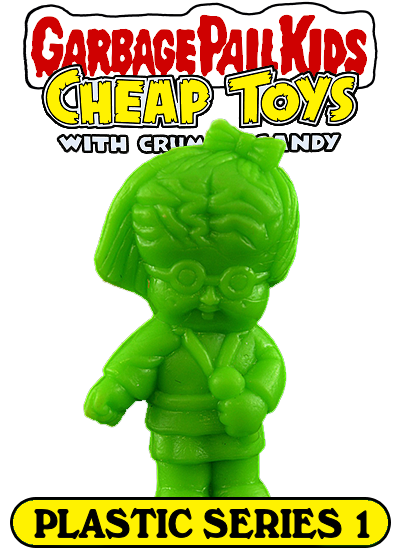 Topps released the 1st series GPK MiniKins series, the next-gen Cheap Toys, in October of 2013, the same month as the Brand New Series 3 sett. 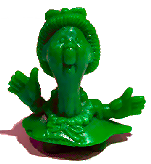 The idea stemmed from the shelved GPK Eraser set that was in talks after the WP Eraser set release several years previously. 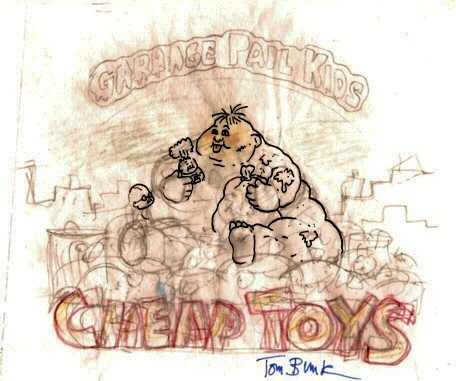 The set contains 26 characters from the GPK Universe, found painted, or in the monochromatic solid colors of blue, red, green, or yellow, as well as the ultra rare, non-labeled, black color for the soft resin molds. A super rare gold color could be obtained via contests and found outside of the packs. They were released with a 1.5 x 1.75 sticker with a mini character bio on the backside. 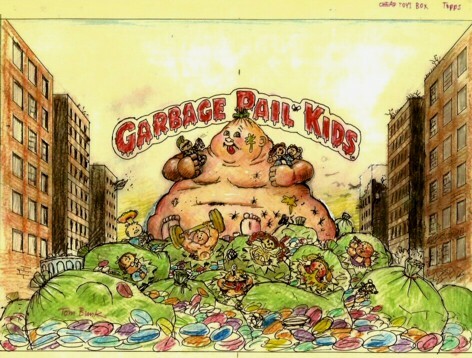 The characters are taken from the several GPK sets: OS1 (9 figures), OS2 (9 figures), OS3 (1 figure), OS4 (1 figure), OS5 (2 figures), Magnet (1 figure), BNS1 (2 figures) and BNS2 (1 figure). The solid colors pay a tribute to the GPK Cheap Toys from the 80's. 2. 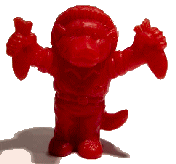 Topps released a 2nd series GPK MiniKins the following year in 2014 (pictured above). 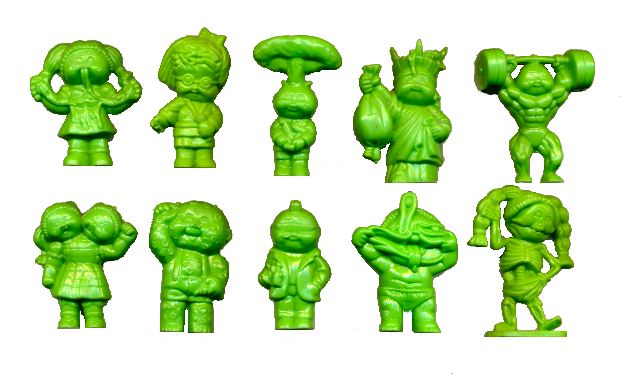 The set contains another 26 characters from the GPK Universe, found painted, or in the monochromatic solid colors of blue, red, green, or yellow, as well as the ultra rare, non-labeled, black color for the soft resin molds. They were released with a 1.5 x 1.75 sticker with a mini character bio on the backside. 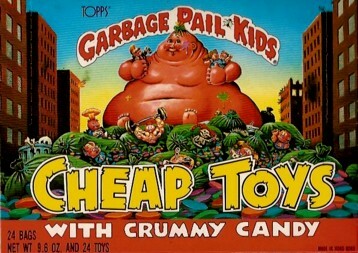 The characters are taken from the several GPK sets.